In my long post below, Celts to Anglo-Saxons, in light of updated assumptions, I had a “cartoon” demographic model in mind which I attempted to sketch out in words. But sometimes prose isn’t the best in terms of precision, and almost always lacks in economy. In particular I wanted to emphasize how genes and memes may transmit differently, and, the importance of the steps of going between A to Z in determining the shape of things in the end state. To illustrate more clearly what I have in mind I thought it might be useful to put up a post with my cartoon model in charts and figures. First, you start out with a large “source” population and a smaller “target” population. Genetically only the migration from the source to the target really has an effect, because the source is so huge that migration from the target is irrelevant. So we’ll be focusing on the impact upon the target of migration both genetically and culturally. To simplify the model we’ll imagine a character, whether genetic or memetic, where the source and target are absolutely different at t = 0, or generation 1. Also, these are discrete generations, and the population is fixed, so you can presume that it’s at carrying capacity. Migration of the outsiders into the target population from the source means less of the original native population in absolute terms (to be realistic this is bidirectional, so people are leaving the target too, but that’s not our concern here). There are two time series which illustrate the divergent dynamics on both the genetic and memetic dimensions. 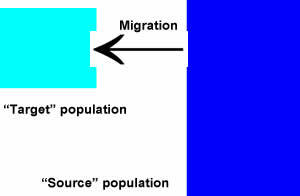 In one series you see gradual and continuous migration from the source to the target population over 13 generations. In another there are two generations of massive migration, before and after which there is no migration. 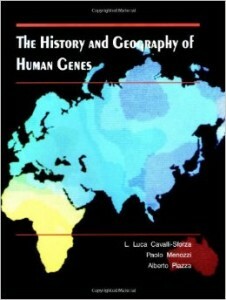 For the genetic character, imagine disjoint allele frequencies at generation 1. So at generation 1 the target population is at 100% for allele A, while the source is at 100% for allele B. Therefore migration of from the source to the target results in a decrease in the proportion of allele A, which is what is being measured on the y-axis. For the memetic character, imagine that it’s language. So at generation 1 100% in the target zone speak language A, while everyone in the source zone speak language B. Again, the frequency on the y-axis is of the proportion who speak language A in the target zone. The big point I’m trying to illustrate are the starkly different end points of the genes vs. the memes. 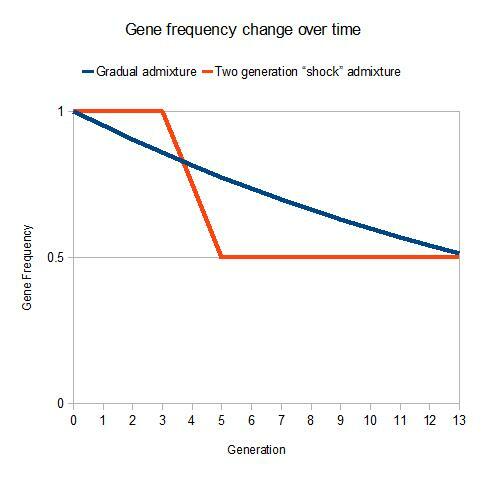 In both the gradual and “shock” scenarios you are at ~0.50 of the original target allele. For the gradual scenario the proportion at t + 1 is determined by the relation (proportion at t )*0.95. 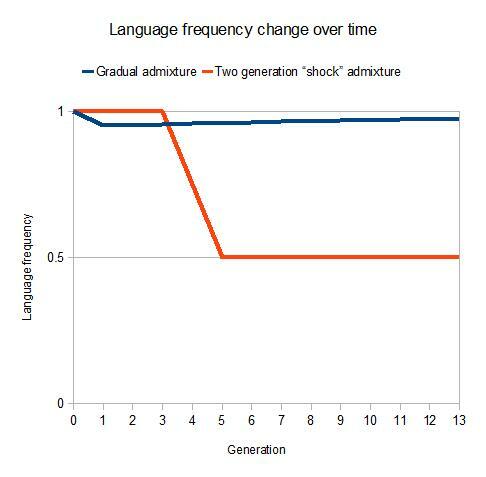 In the shock scenario that’s a 0.25 absolute value shift over two generations. The key is to notice the difference between the end states in the memetic scenario. There is a congruence between the shock models for both genes and memes, but a huge difference between them in the gradual scenario. Why? Concretely I just assumed that the only people in the gradual scenario who spoke the language of the source population would be the migrants themselves. All of their children would speak the target population language. Over time the number of migrants from the source population are smaller in the gradual scenario because you don’t need as many to decrement the target allele frequency by the same proportion (because the value of proportion at t keeps dropping). More abstractly I am implying here that the change in language frequency has some non-linear response dynamics, at a minimum. If you have a very small number of speakers of a given language, then the vertical transmission may be ~0, while a moderate number may result in a nearly perfect transmission to the next generation. That’s because language fluency has vertical and horizontal dynamics, as well as potential asymmetric ones between the two parents. By this, I mean that what language you speak is a function of the peer groups your parents place you in, as well as their own maintenance of their original language. 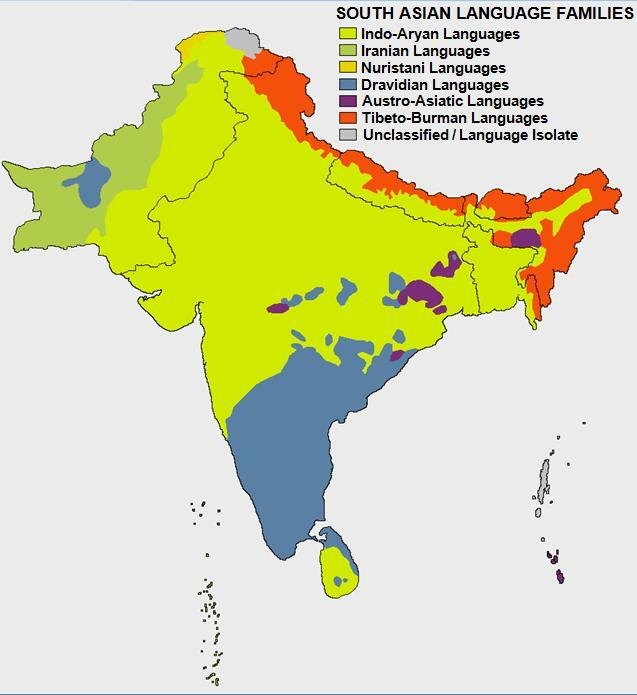 If the source migrants in the gradual scenario are spatially equally distributed across the island then it may be that their offspring will lack the “critical mass” required to maintain the fluency of the language of their ancestors from the source population. And, more likely if the source migrants intermarry immediately at a high fraction with natives of the target population, then it is likely that their children will be socialized with people who speak the target language rather than their immigrant parent’s source language. The child is 50% immigrant genetically, but may be far less than 50% immigrant culturally. In the shock scenario none of this may hold. The migrants are a huge proportion of the population in the initial generation and subsequent generation of migration. They don’t need to find partners from the native population, and have the critical mass whereby they can recreate the source population culture rather easily. They are a society within the society, and don’t need to interact with the broader target population. As far as the replication of a German culture on British soil goes I’m positing that something closer to the shock scenario occurred. The proportion of migrants need not be the majority, rather, the migrant culture simply needs to have critical mass in terms of coherency to seal itself off from native influence. Now imagine a scenario of inter-cultural competition where at some point in the future one culture must fix, and replace the other, and that the probability of fixation is proportional to raw numbers. If the natives outnumber the migrants by a factor of four, then there’s still a non-trivial probability that migrant culture can win out. As a matter of fact I think that the Germans may have had other advantages which leveled the playing field, outlined in the previous post. But the critical issue for me is that a “folk wandering” scenario makes it possible that German traits would persist relatively undiluted on British soil. One where male war brands immediately take up with local women in generation 1 makes it impossible to prevent some significant cultural hybridization. Are Genes the Key to the Yankee Empire? 3 Comments to "The Different Dynamics of Memes vs. Genes"
Are memes distinguishable from the traits that are expressions of memes? Another key factor in memetics is status. The impact of high status individuals relative to low status individuals in memetics is generally going to be much greater than it is in genetics. High status people in ancient times did have more kids who survived to adulthood than low status individuals, but there are many historically known cases where a small elite ruling caste caused a major language transition (e.g. Hungary, Turkey, South African, early Mexico), or where the practices of a few rulers was emulated by almost the entirely ruled population (through a mix of imitation and imposition), such as the practice of the religious affiliation of the ruler making the choice for his entire fiefdom. This seems to point to another possibility. Mao needed to burn through two generations of the source population (rural peasants and petit bourgeoisie) to drive translation to the target population of well educated urban moderns. He almost lived to see his tipping point for modernity. But Reagan completely defeat world communism if you allow the GOP to define “did”, “defeat” “communism” and “world”. Just sayin.